The angel banishing sigil is a form of blood magic that must be drawn in fresh blood. It temporarily banishes angels (except the one who drew it) from that location. The amount of time the angel stays gone is only a matter of hours with Dean stating after using the sigil in 7.21 Reading Is Fundamental that they have "three, four hours tops" before the angels can return. It typically acts as a defensive measure of last resort, banishing angels that the user cannot otherwise defeat in combat. While the user typically creates large sigils, the size does not appear to effect the power of the spell. In 11.14 The Vessel, Sam was able to use a small banishing sigil to banish Lucifer, the most powerful angel known to have had the sigil used on them. However, in 5.18 Point of No Return, Castiel banishes four angels and himself with a sigil he carved on his chest. It banishes the angels in range to another location on Earth as after being banished, Castiel wound up on a fishing boat after banishing himself and the other angels and later in in 7.21 Reading Is Fundamental, he calls from a dog track in Perth, Australia. When an angel is banished, they will appear as a comet crashing to Earth, with radio interference signal their arrival. It may also weaken the angels when they are banished, as Castiel notes that it takes banished angels some time to return after they are exposed to such a sigil, Castiel lost most of his remaining powers after being cut-off from Heaven when he banished himself. The base design of the sigil is generally the same, although substantial variants are used by Samuel in 6.10 Caged Heat and Dean in 12.10 Lily Sunder Has Some Regrets. When Sam used another variant in 13.01 Lost and Found, the angel blade being held by one of the angels that was banished was left behind and dropped to the ground, a never before seen effect of the sigil. As seen on multiple occasions, the sigil will banish every angel in the room its used in and does not discriminate. In 7.21 Reading Is Fundamental, Dean uses the sigil to get rid of Hester and Inias, but banishes Castiel as well in the process as he was in the room. However, the sigil's banishing effect appears to have a limited range as in 13.01 Lost and Found a banishing sigil got rid of Conrad and Lily who were in the same cell with Sam, but failed to banish Miriam who was several rooms away. Additionally, the sigil used by Dean in 9.01 I Think I'm Gonna Like It Here banished two angels he was fighting in a hallway, but left Gadreel, who was in a room right next to the fight, unharmed. In 11.21 All in the Family, Metatron attempts to use a variant of the sigil on Amara, suggesting that it may effect more than just angels. However, Amara is unharmed by the effects of the sigil and is just amused by the try. According to Ishim in 12.10 Lily Sunder Has Some Regrets, an angel banishing sigil can be fatal to an angel that is in a weakened state. 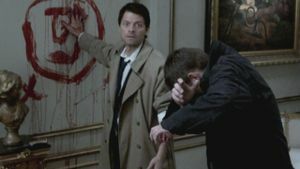 Ishim suggests that the injured and weak Castiel will be "splattered all over the walls" if Dean activates his sigil. Its unclear if Ishim was telling the truth or simply bluffing to get Dean to back down. Nephilim have been shown to be the only angelic beings immune to the sigil. While use of the sigil in the vicinity of a Nephiliim won't banish them, it can still have a temporary debilitating effect on them. See Enochian and Warding Sigils pages for sigils that will prevent an angel from entering a building. When Sam and Dean join Ruby who has hidden Anna Milton from Alastair; Castiel and Uriel appear and proclaim they must kill Anna. As the angels attack, Anna cuts herself and draws the sigil, sending the angels away. Anna banishes Castiel and Uriel. After Castiel found out about Zachariah's true plan he wanted to warn Dean and Sam, but he was ambushed by some of his superiors. Castiel engaged in an angel on angel battle with some of his superiors. After this angelic battle, Castiel was taken up to Heaven for re-education on angelic obedience. Sam and Dean find the sigil in the place where they were to meet Cas; he presumably used it to try and fight off his captors but its unclear if he succeeded in using it or not. In the aftermath of Castiel's battle. Castiel uses the sigil to banish Zachariah after he decides to help Dean get to Sam, in hopes of preventing Sam from killing Lilith. Dean uses the sigil, which was all ready and hidden at Chuck's place, to banish Zachariah along with two more angels. Dean banishes Zachariah along with two other angels. 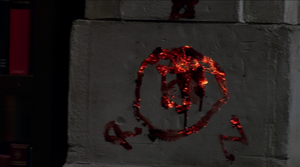 Sam uses a sigil to banish Anna during their first confrontation in 1978. Later, Dean shows John how to make the sigil, but when Anna and Uriel arrive, they somehow defuse the sigil before the Winchesters can activate it. 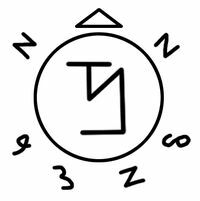 Dean uses a sigil to banish Castiel to escape from Bobby's panic room. Later, while fighting four angels in the abandoned muffler factory, Castiel takes off his shirt to reveal the sigil carved into his chest with a box cutter. He puts his hand on it and banishes the other angels and himself, giving Sam and Dean an opening to go to the Green Room. Castiel uses the sigil that he engraved into his chest to wipe out the angels (including himself) guarding the Green Room. 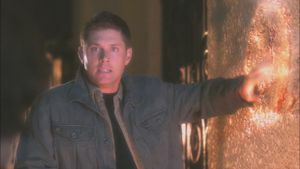 Outside of Balthazar's house, Dean and Sam are confronted by a hostile angel. 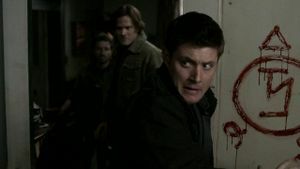 He is a soldier of Raphael and, rather than fight him with the angel blades they have in their possession, Dean banishes him with a sigil etched on a wall of Balthazar's house. Dean uses the Sigil to banish two angels loyal to Raphael. 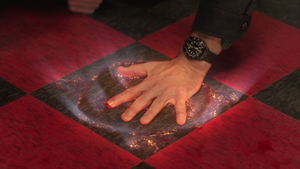 Samuel draws a modified version of the sigil and activates it, banishing Castiel temporarily. 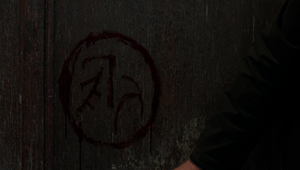 Samuel uses a different type of sigil to banish Castiel. After Hester and Inias arrive and threaten, Sam, Meg, Kevin Tran and Castiel; Dean uses the sigil to banish all three angels. While it is unknown where the other two angels went, Castiel ends up at a dog track in Perth, Australia. The burning sigil after Dean has banished Hester, Inias and Castiel. Unable to defeat two angels that are looking for Castiel, Dean tricks them into stopping beating on him then reveals that he drew a banishing sigil on the floor in his own blood, asking them where they will be sent as Heaven is closed. Before they can react, Dean uses the symbol to banish the two angels and leaves before any more can show up. 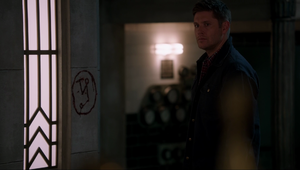 Dean draws a sigil on the floor, after taking a beating from two angels. When confronted by Ephraim, Castiel cuts his hand with the thorns of a rose and uses his blood to draw an angel banishing sigil on a glass pane. However, before he can use it, Ephraim notices and stops him. Castiel's attempt to banish Ephraim. 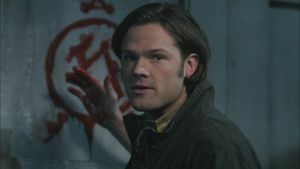 While Lucifer is distracted with the Hand of God, Sam cuts himself and draws an angel banishing sigil on the Bunker wall. As Lucifer advances on Dean, Sam banishes him with the sigil. The sigil after Sam banishes Lucifer. 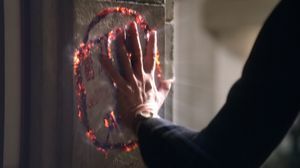 In an attempt to buy Sam time to escape with Lucifer, Metatron creates a variation of the angel banishing sigil and attempts to use it on Amara. While the sigil engulfs Amara in a white light, it has no effect on her and finds Metatron's efforts amusing. The sigil Metatron uses against Amara. As Sam and Castiel enter the Men of Letters Bunker, Lady Antonia Bevell uses an angel banishing sigil to banish Castiel so she can capture Sam. Lady Bevell ignites the angel banishing sigil against Castiel. After being banished by Lady Antonia Bevell, Castiel is blasted through a billboard and into a field about three hours away from Lebanon, Kansas appearing to be a comet or meteor to the naked eye. Upon returning to the Bunker, Dean spots Toni's sigil on the wall and Castiel returns moments later to explain what happened to him. 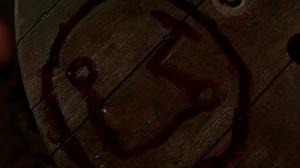 Dean comes across the banishing sigil used by Lady Toni. 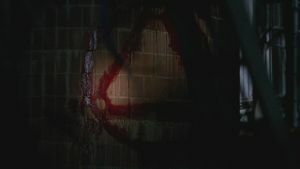 As Castiel is left beaten and bloody by Ishim, Dean draws a variation of the banishing sigil on a wall, and threatens to use it. Only hesitating when Ishim suggests it may kill Castiel in his weakened state. But, before Dean is able to make a decision, Sam and Lily Sunder arrive and continue the fight against Ishim. Dean prepares to use a variation on the banishing sigil. 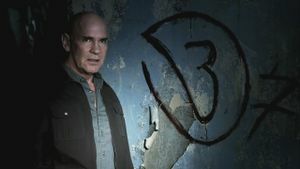 Unable to defeat the two angels, Conrad and Lily, attacking him and Jack, Sam creates an angel banishing sigil on the floor of his jail cell and banishes Conrad and Lily instead. The sigil does not harm Jack nor does it banish an angel several rooms away. The banishment also caused Conrad's angel blade to be left behind as he was banished, resulting in it dropping from midair once he was gone. Sam draws a variation symbol after being beaten down by an angel. Under attack by multiple angels, Sam suggests allowing them in and then banishing them with the sigil. However, Dean recognizes that it won't work as if the angels get in, they will all die. 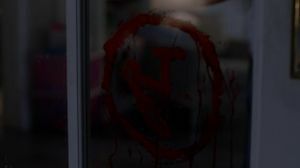 In the alternate timeline created by the disappearance of John Winchester in 2003, Sam creates an angel banishing sigil out of the blood from his injuries caused by the alternate Castiel. Sam uses the sigil to banish Castiel before he can kill Dean. Sam actives the sigil sending the alternate timeline Castiel away. This page was last edited on 23 April 2019, at 09:44.